Christopher Barry, who has died aged 88, directed many notable television series, ranging from science fiction to historical dramas and literary adaptations. At the heart of his work was a 16-year association with Doctor Who. It began in 1963, with the inaugural appearance of the Daleks – the metallic creatures that would become the most enduring monsters in the show's history. Of Barry's remaining stories with the first Doctor, William Hartnell, The Romans(1965) was an exercise in knockabout comedy, and The Savages (1966, though now lost) a thoughtful morality tale. When ill health compelled Hartnell to hand over the part of the Doctor to Patrick Troughton, Barry worked closely with the incoming actor, who was initially unsure how to play the part. The resulting adventure, The Power of the Daleks (1966, though again lost), was considered one of the show's high points. With the third Doctor, Jon Pertwee, Barry devised an atmospheric ambience for The Daemons (1971), filmed in the Wiltshire village of Aldbourne. The Mutants (1972) was a satire on apartheid. In 1974, Barry once more found himself looking after a new Doctor, Tom Baker, in his first adventure, Robot. The Brain of Morbius (1976) proved to be controversially graphic: at one point a blood bag bursts open on a character's chest when he is shot at close range. Barry's last story with Baker and the series, The Creature from the Pit (1979), was marred by the appearance of the monster, which was resolutely disconcerting despite last-minute modifications on the studio floor. Barry's other science-fiction work included the anthology series Out of the Unknown (1969), Moonbase Three (1973) and The Tripods (1984, based on John Christopher's literary trilogy). More down to earth were the soap opera The Newcomers (1965), the long-running police series Z-Cars (many episodes from 1967) and the medical drama Angels (1976). Christopher was born in Greenwich, London, the son of Gerald Barry, a newspaper editor who went on to be knighted for his work as director general of the Festival of Britain in 1951, and his first wife, Gladys. After studying at Blundell's school, in Devon, and Cambridge University, Christopher joined the RAF and trained in Canada, although the second world war came to an end before he saw active service. Inspired by a passionate interest in the performing arts he joined the script department at Ealing film studios. He was a producer's assistant on The Man in the White Suit (1951) before graduating to assistant director or second assistant director on many films including Lease of Life, Out of the Clouds and The Ship That Died of Shame. In 1955 he joined the BBC as a production assistant, after an exodus of talent to the new ITV network. His experience at Ealing ensured that directors with mostly theatrical experience relied on him to take care of tricky film sequences on their behalf, and so by 1958 he was directing on series such as the magazine soap opera Compact (1962) and the second world war anthology series Moonstrike (1963). His work on historical and period dramas included Smuggler's Bay (1964), adapted from John Meade Falkner's Moonfleet, The Further Adventures of the Musketeers (1967), featuring Joss Ackland and Brian Blessed, and Nicholas Nickleby (1977), starring Nigel Havers. From 1978, Barry also directed many episodes of the popular All Creatures Great and Small, based on the series of books by the vet James Herriot. 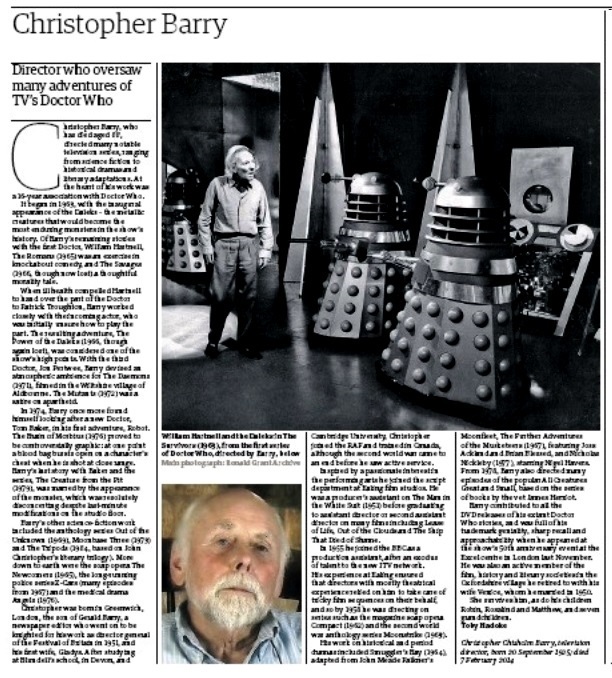 Barry contributed to all the DVD releases of his extant Doctor Who stories, and was full of his trademark geniality, sharp recall and approachability when he appeared at the show's 50th anniversary event at the Excel centre in London last November. He was also an active member of the film, history and literary societies in the Oxfordshire village he retired to with his wife Venice, whom he married in 1950. She survives him, as do his children Robin, Rosalind and Matthew, and seven grandchildren. APA 6th ed. : Hadoke, Toby (2014-03-21). Christopher Barry obituary (The Guardian). The Guardian p. 43. MLA 7th ed. : Hadoke, Toby. "Christopher Barry obituary (The Guardian)." The Guardian [add city] 2014-03-21, 43. Print. Turabian: Hadoke, Toby. "Christopher Barry obituary (The Guardian)." The Guardian, 2014-03-21, section, 43 edition. This page was last modified on 18 June 2014, at 23:14.